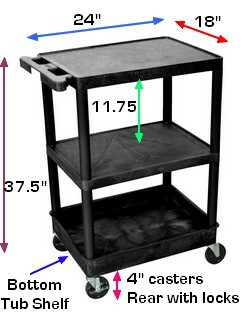 This is a commercial grade utility cart, Made in USA, with Lifetime Warranty. 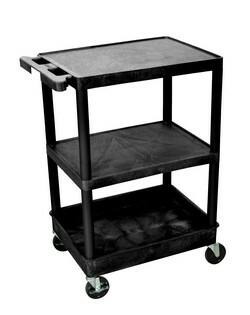 The pictured item has (1) flat top, (1) flat middle shelf and (1) tub bottom shelf. A push handle is molded into the top shelf. 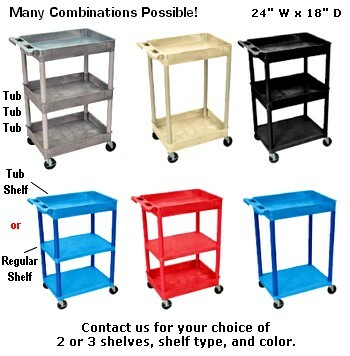 You can also build your own configuration, by choosing your color, plus the quantity & type of shelves, with the drop down menu on the left, when ordering.